Nowadays the demand of video and display resolution as well as data transmission rate is keep on increasing that existing hardware cables no longer able to support. While the new standards such as USB 3.0 and DisplayPort have been defined to address such high bandwidth limitation, they tend to add complexity in terms of additional cabling and connector design. As an effort to streamline and reduce the pin-counts of the actual connector, Apple Inc has recently filed a new patent idea with proprietary cable definition for both USB 3.0 and DisplayPort transmission data targeted for portable media device. 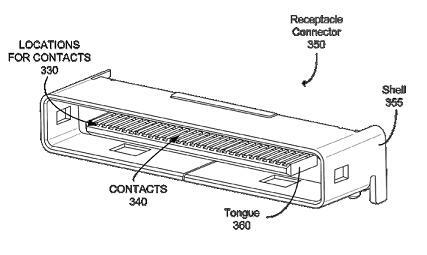 The new patent emphasizes on a series of necessary pins in single row with ability to carry both USB 3.0 and DisplayPort data that would otherwise has to be handled differently with multiple separate connectors. Available in both male plug and female receptacle connector, it can accommodate up to 4.8Gbps for USB 3.0 standard protocol and at the same time with transmission up to 4.1MP utilizing four lanes on DisplayPort. The benefits are obvious – manufacturer will able to utilize the new standard multiple connector pins definition with simplified form factor design as well as overall BOM (Bill of Material) cost reduction especially when a new standardized form factor being defined and pushed to industry. On the other hand, consumers can expect a much slimmer end products with less cabling for connectivity as compared to current designs that will definitely able to simplify its usage with true mobile capability while on the move. However, this is with assumption that both USB 3.0 and DisplayPort are needed in the usage model, else it may ended up staying at patent office as pure innovative idea without actual implementation in end products.